Recent release “A Chance for Fulfillment” from Page Publishing author Julius Feliciano Warthen is a prolific work of fiction that explores the ideas of personal identity and finding one’s self. Julius Feliciano Warthen, a retired employee in the Human Rights Law with the District of Columbia Government, volunteer, devoted writer and author, has completed his new book, “A Chance for Fulfillment”: a passionately crafted work about fate, friendship, acceptance and understanding. Published by New York City-based Page Publishing, Julius Feliciano Warthen’s mesmerizing tale will leave the reader inspired. In "A Chance for Fulfillment", Julius Feliciano Warthen tells the compelling story about Lionel Gamaliel Wilson, a young, African American, male, and his plight towards fulfillment of his dreams for obtaining and completing his desired level of education. Fate brings Lionel Wilson and Dr. David Malcom together. Lionel initially viewed Dr. Malcom with suspicion, but soon realized that Dr. Malcom was his life's blessing, and the person who would nurture his growth and transition. Along his plight, fate also brought another person into his life who became an inseparable friend, brother and integral part of his life. Lionel found romance with a young lady who provided his needs for true, supportive love. 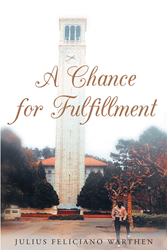 Readers who wish to experience this profound work can purchase “A Chance for Fulfillment” at bookstores everywhere, or online at the Apple iTunes store, Amazon, Google Play or Barnes and Noble.